I've been quietly looking into noise recently. There was an article back in November in a Danish newspaper about the negative effect traffic noise has on the population. A good, informative article stating that 800,000 Danes are exposed to harmful levels of traffic pollution in the form of noise alone. That's about 15% of the population. The article goes on about how very little is being done in Danish cities about reducing traffic noise. 400 million kroner were earmarked by the current government for noise reduction in 2009 but the government only manages the national roads. They have spent money on reducing noise on motorways but it's the municipalities that manage the city streets - along which most people live, 90% of them in fact - and here there is little being done. Shockingly so. What didn't really surprise me was that the article didn't mention anything about speed reduction. It was all about windows. Classic 'ignoring the bull' talk once again. Indeed, investing in new, sound reducing windows is an effective way of cutting out the traffic noise. They can result in a 12-15 dB reduction. Property prices even rise if the windows are sound-reducing. But is it all just about windows, I wondered? Firstly, what is wrong with traffic noise? There have been studies in Denmark that show that traffic kills 10 times more people than traffic accidents. Car emissions and noise pollution knock off 4000 Danes a year and although most succomb to the emissions, noise plays a role as well. Between 200-500 people die prematurely from heart disease and high blood pressure due to traffic noise. "Research shows that noise can kill, as it increases the risks for high blood pressure and heart attacks (3% of heart attacks in Germany are due to road traffic noise). Noise disturbs sleep and heavily impacts on people’s quality of life. Besides its health and social costs, noise has economic consequences in terms of reduced housing value and taxes, as it is a relevant reason for people to move out of cities into suburban areas." According to The World Health Organisation's Guidelines for Community Noise about half of the EU citizens (EU 15) are estimated to live in areas which do not ensure acoustical comfort for residents: 40% of the population is exposed to road traffic noise with an equivalent sound pressure level exceeding 55 dB during daytime, and 20% to levels exceeding 65 dB. At night, more than 30% are exposed to sound levels that disturb sleep (exceeding 55 dB). 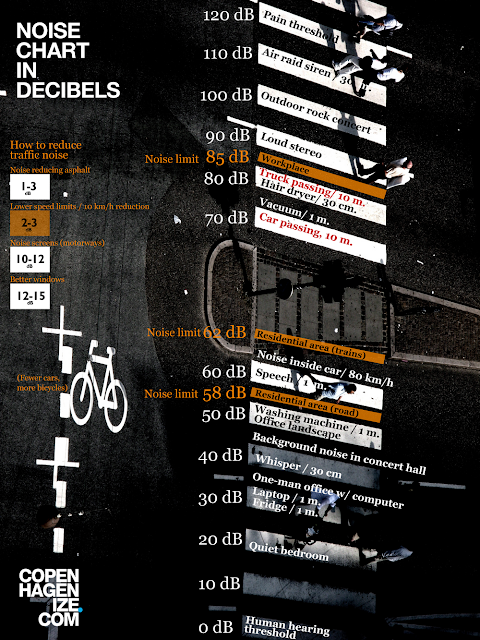 If you look at the infographic we whipped up at the top, you can compare the decibel levels for various daily noises. The Danish noise limits are also listed and what is striking is that the noise that cars and trucks make when passing by (whilst talking on mobiles or fiddling with the radio) at 10 metres is higher than the noise limits in residential areas for road noise. Right there we have trouble. The City of Copenhagen has a goal that all its citizens can sleep peacefully and free of traffic noise in 2015. By all accounts the City is way behind and it is not likely that they will reach the target. So how to fix it? And I don't mean ignoring the problem and merely suggesting everyone get new windows. There is resurfacing the roads with noice reducing asphalt. The city of Frederiksberg in which I live is in the process of doing so. Although it seems like an enormous investment for a reduction of only 1-2 dB. Especially when I started looking into the benefits of reducing speed limits. With over 70 cities having implemented 30 km/h zones around Europe there are now well-documented statistics that 30 km/h speed limits save lives. What about noise though? Well, it turns out that lowering speed limits DOES have a positive effect on noise pollution. "When reducing the actual speed by 10 km/h, a noise reduction of about 2-3 dB can be achieved." "Reducing speed limits alone is not enough, because driver compliance with the new levels is low. Different types of traffic enforcement are therefore necessary. The political acceptance for the measure is often low." "The advantage of this measure is that it is efficient from the first day of implementation, and cheap compared to other measures." In order to get some more details I emailed Kåre Press-Kristensen, M.Sc in Environmental Engineering, Ph.D. and consultant for the Technical University of Denmark. I asked him if speed reduction had a meaningful effect on noise reduction. There is, as you can see, no linear connection and 40 to 30 km/h doesn't offer any real result. But: 60 --> 30 km/t reduces 2.1 + 1.3 + 0 = 3.4 dB - which is a bit more than an halving of the noise. On the other hand there aren't many stretches where this will happen. The above also presupposes that motorists will stick to the new speed limits. When the speed limit in Copenhagen is reduced from 60 km/h to 50 km/h there is only estimated a reduction of 4 km/h in the car speeds." Indeed. Incredibly cheap compared to resurfacing the city streets with new asphalt. AND you get an even higher reduction in noise levels for a fraction of the cost. Although if a city is going to resurface anyway, then why not kill two birds with one stone and lower the speed limit at the same time? 10 or 20 km/h less. From 50 km/h to 30 km/h. What an amazing, cost-efficient result. Good for noise pollution. Good for saving lives in traffic and reducing injuries. Good good good. Just add some extra resources for policing the motorists accordingly and you're there. Astoundingly, lower speed limits hardly register on the political agenda in this car-centric land. There was some talk of 40 km/h zones a while back, but that seems to have faded. The police control the speed limits in Denmark and they are not willing to accommodate the idea of lowering them. As we've highlighted here. And without politicians who are willing to push for them, the idea is dead in the water. In fact, just yesterday, the current right-wing government bucked the global trend and RAISED the speed limit on 10 stretches of highway in the country, from 80 km/h to 90 km/h. Boggles the mind. All it takes is changing the numbers on some signs from 50 to 40 or 30. That's it. Changing signs. Are we doing it in Copenhagen or Frederiksberg or Denmark? In the EU, only France applies lower general speed limits for bad weather conditions. In case of rain or snow, the speed limit for motorways changes from 130 km/h to 110 km/h and at rural roads from 90 km/h to 80 km/h. In case of fog (visibility less than 50 meters) the speed limit on all types of roads is 50 km/h. Both Finland and Sweden apply different general speed limits in wintertime. In Finland, the speed limit at motorways changes from 120 km/h to 100 km/h and, on main rural roads, from 100 km/h to 80 km/h. Similarly in Sweden the speed limits change respectively from 110 km/h to 90 km/h and from 90 km/h to 70 km/h. In France, it is common to reduce the general speed limit by 20 or 30 km/h on a temporary basis, generally in case of high temperatures, with the aim to reduce air pollution and smog.